John McDonnell has said he "agrees with the prime minister" that the Russian state is "responsible" for the Salisbury spy poisoning. The shadow chancellor told ITV "whichever way you look at it", Russia's Vladimir Putin "is responsible and all the evidence points to him". Labour leader Jeremy Corbyn has been criticised for not blaming the Russian state categorically for the attack. A Labour spokesman said there had been "no shift" in Labour's policy. Former Russian military intelligence officer Sergei Skripal, 66, and his daughter Yulia, 33, remain critically ill in hospital after being found slumped on a bench on 4 March. Detective Sergeant Nick Bailey, who was exposed to the nerve agent while responding to the incident, is no longer considered critical but remains in hospital. Asked whether he blamed Mr Putin for the attack, Mr McDonnell told ITV's Peston on Sunday: "I agree completely with the prime minister. "What she's said is that Russia is culpable, either by direct commission - either [President] Putin's ordered this - or they've lost control of their supplies." He added: "There's a pattern of people being murdered here, therefore it leads you to the conclusion that Putin has questions to answer, because this is highly likely this could have been a state execution." Mr McDonnell defended his leader's Commons response to the prime minister's statement - in which he condemned the attack, but raised questions about Russian donations to the Conservative Party and criticised cuts to the Foreign Office. Conservative MPs accused him of political point scoring, while some Labour MPs suggested he had misjudged his response. "It was a critique. It was asking questions about investment in diplomacy, it was asking questions about where you go from here in building that international coalition. "That is what oppositions do and it was a constructive critique, I think others have misread that." He called for the introduction of an "oligarch levy" to strengthen the UK's hand in imposing effective sanctions on Russia. The position may not have officially changed, but the language clearly has. Senior Labour politicians are choosing their words carefully after Jeremy Corbyn's statement to Parliament on the Salisbury attack was criticised by some of his party's MPs. 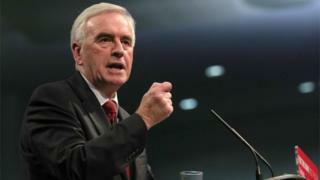 The shadow chancellor struck a bullish tone, saying it was "highly likely this could have been a state execution". A more measured line came from Shadow Attorney General Shami Chakrabarti, who said: "Russia is looking responsible." A few days ago Sir Keir Starmer, the shadow Brexit secretary, said the attack should be condemned, "no ifs, no buts". All of the above is consistent with the leader's position, the party maintains. So what difference does a subtle shift in language, tone or emphasis make? It all adds up to the message. And in the last few days, for Labour, that has been far from clear. On Wednesday, Prime Minister Theresa May told the Commons that Russia was "culpable" for the attack and that she was expelling 23 Russian diplomats. Moscow has denied all involvement, and expelled British diplomats in turn. On Thursday, amid calls for him to be firmer in his condemnation of Russia, Mr Corbyn said the "evidence points towards Russia on this". But later in an article for the Guardian newspaper, he drew a link with the build-up to the war in Iraq and warned people not to "rush ahead of the evidence". He condemned the attack but argued the involvement of Russian "mafia-like groups" could not be ruled out. More than 30 Labour MPs have signed a motion which "unequivocally" accepts the Russian state's "culpability". Backbencher Stephen Kinnock told the BBC on Friday the Guardian article had "muddied the waters somewhat". But senior Labour figures denied the party was divided over the issue. Shadow Attorney General Shami Chakrabarti told BBC One's Andrew Marr Show: "I am here to make clear that I am completely at one, not just with Jeremy but with Nia Griffith, Emily Thornberry, Keir Starmer. "We must condemn Russian responsibility, whether it is negligent or whether it is even more serious." The Labour Party has denied Mr McDonnell's comments are a shift in its position over culpability for the poisoning. A spokesman said: "This week the prime minister laid out two alternatives: that Russia is directly responsible, or negligent because it lost control of this nerve agent. "Labour agrees that the evidence overwhelmingly points to those two alternatives. "The Russian authorities must be held to account on the basis of the evidence and our response must be both decisive and proportionate."